Before many fellow students wake up, the University of Washington rowing teams often will have rowed 20 kilometers. They gave The Seattle Times an up-close look. 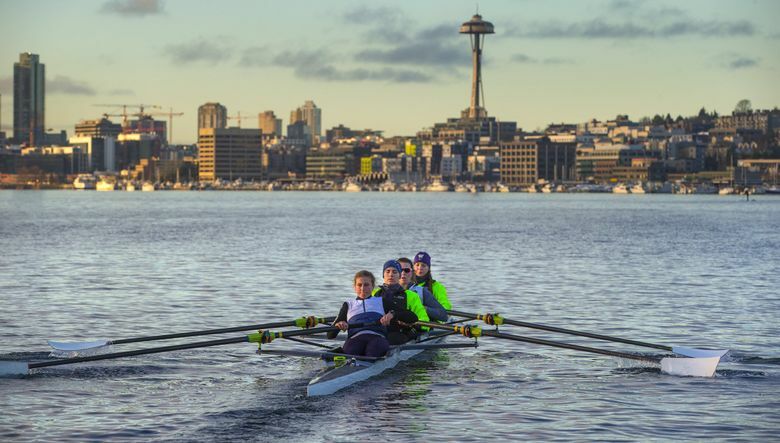 Editor’s note: The UW rowing coaches recently allowed The Seattle Times to tag along for a one-day, up-close look at the programs. The sun is still an hour from rising over the shores of Lake Washington, the temperature is 31 degrees, and there are snow flurries just to the north. It’s the kind of early morning when almost anyone would prefer being warm in bed, but you don’t win national rowing championships without putting in a lot of work, no matter the weather or the hour. So before many fellow students wake up, the University of Washington rowing teams often will have rowed 20 kilometers. And after finishing classes, they’ll do it again. Next Saturday, crowds will line the Montlake Cut, cheering the Husky men’s and women’s rowing teams during the annual Class Day Regatta. It will be a rare day in the spotlight for the rowers. What fans don’t see is the hours of hard work put in before such moments. There are no shortcuts. For the UW women, last year’s historic national title, in which it became the first team to sweep all three races, is no longer discussed. The focus is on getting better. For the men, there is no shortage of motivation, not after losing last year’s national title to Yale by .069 seconds in a photo finish. For a program that won seven titles during a recent nine-year stretch (2007-15), coming that close is not enough. That’s why, on this frigid morning, just a few minutes past 6 a.m., rowers begin streaming into Conibear Shellhouse. It is time to get to work. The shellhouse is a jovial place as dozens of rowers are ready to begin their work — laughing, talking and showing no signs of the morning grumps. They are surprisingly energetic, considering the hour. For senior Jessica Thoennes, who was on the UW women’s varsity eight team that completed last year’s NCAA sweep, it’s never easy when her alarm goes off at 5:30 a.m. But there is no shortage of motivation. At 6:30, the men’s team begins running inside the shellhouse, then does jumping jacks. It is clear that every one of the next 90 minutes or so has been meticulously choreographed by coach Michael Callahan, 44. On this morning, most of the team will work indoors on rowing machines that monitor every movement. A group of eight freshmen, however, will hit the water for some drilling and endurance training. Following them in a motorized boat will be assistant Sam Dommer, who helped UW win three national titles before becoming part of the U.S. men’s eight that finished fourth in the 2016 Olympics. The freshmen leave the boathouse at 6:45 a.m. It’s remarkable how fast eight rowers and a coxswain can make a boat move. Like most practices, they will log about 20 kilometers (12.4 miles). Armed with a megaphone, Dommer is part cheerleader, part teacher and part drill sergeant. In less than 15 minutes, the eight have made it through the Montlake Cut and are on Lake Union. By 7:20 a.m., the rowers near the Ballard Bridge. It’s time to start working their way back. Some have class at 8:30, and Dommer wants to get them back by 8. He likes what he is seeing. It’s 7:50 a.m. on the Montlake Cut, and UW women’s coach Yaz Farooq is driving a motorized boat while watching two boats with four rowers each. For Farooq, in her second season at UW, it will be impossible to improve on last year’s showing at the NCAA championships. But she believes her team can get better, and she is relentless in that pursuit. She has sent her team out in fours, even those who likely will be on the varsity eight, because even greater synchronicity and balance are needed to be successful in the smaller boats. Farooq, 52, has a detailed plan for the morning practice written on a sheet near the steering wheel. On Sundays she spends about 4½ hours devising the plan for the week. Farooq watches two boats as they make their way toward the Ballard Locks. Farooq intersperses bits of instruction from the megaphone, with “yes, yes, yes.” She is relentlessly positive. If her rowers are grateful for Farooq, she is just as grateful being here. At Stanford, where she previously coached, her team had a 20-minute drive to the boathouse, and thus practiced only once a day on the water. 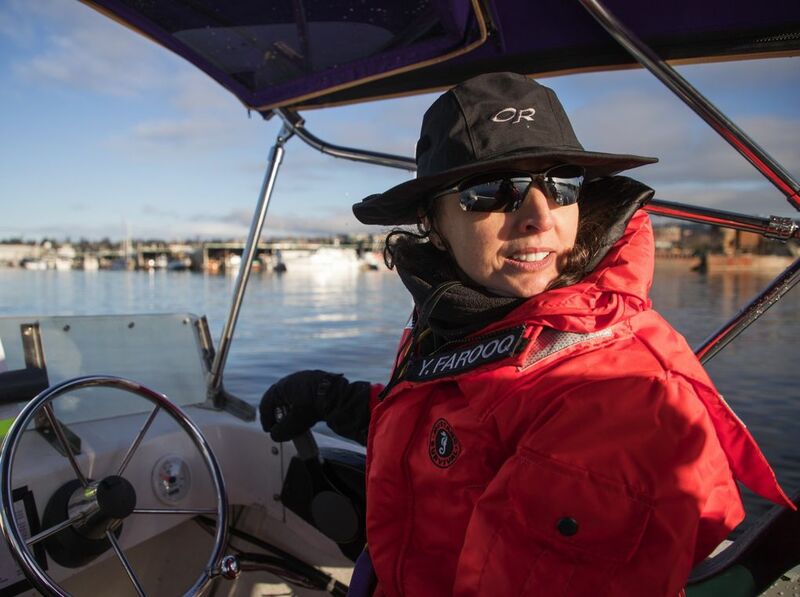 Getting on the water twice a day is a huge advantage, she said. “I am blown away every day with what we have here,” Farooq says, referring not just to having a boathouse on campus but to the rowing culture in Seattle. A few days earlier, during a practice “that had all four seasons: rain, snow, hail and sunshine,” a barge was heading into the Montlake Cut just ahead of her team. Farooq rode to the barge skipper and asked if he would let the Huskies go first. Meanwhile, Farooq is coaching, maneuvering her craft to watch both boats. They, too, will row 20 kilometers this morning. “That’s more (exercise) than some people do in a day or two,” Farooq said. Practice is over, and it is 9:15 at the Pit Stop, located across the road from the shellhouse. It’s filled with rowers grabbing burritos, muffins, yogurt and other breakfast items. There is no time to waste, as many have 9:30 classes, and there is a long walk up several sets of stairs to get to the main campus. For senior Sarah Clark, this is normal. She has classes from 9:30 a.m. to 1:30 p.m., then afternoon rowing practice at 2:30. Then she’ll eat dinner and spend at least a couple hours studying, all while knowing she has to be up at 5:15 a.m. to do it all again the next day. “There isn’t a lot of free time,” she said. The day before, Callahan had ridden the 33-mile Chilly Hilly on Bainbridge Island, named for its 2,191 feet of elevation gain. Callahan has the look of an electrical engineer, and he is on the front end of new technology, wiring his boats with machines that measure different aspects of every stroke. He wants data, data and more data. His friendly, easygoing personality belies what his rowers say is a fierce desire to win. His relentless pursuit of excellence also propelled him in his rowing career, leading Washington to four Pac-12 titles and serving as team captain as a senior in 1996. He later competed in three World Championships and in the 2004 Olympics before making his way back to UW, where he has won six national titles in 10 seasons as head coach. As much as Callahan embraces new technology, he also has a reverence for traditions. One of those is the Ham ’N Egger race that will soon take place. In these races, crews are randomly created by drawing names from a hat. Each winner gets a star next to his name on a board and a Ham ’N Egger T-shirt. The Ham ‘N Eggers began at UW in 1950, and these fun competitions break up the monotony during the winter months, when there are big gaps between competitions. The tradition lives on even if the origin of the name has long been forgotten. This is the seventh and final Ham ’N Egger of the year, and even though it’s just minutes from the teams being picked, the men could not be any looser. Several are kicking a soccer ball, others are joking and laughing, and then suddenly, the group comes together for some pushups. After they’re done stretching, Callahan introduces rowing alumni who have come to visit, and each receives a huge ovation. One of them is Sam Ojserkis, the coxswain on the Huskies’ NCAA title-winning varsity eight boats in 2011 and 2012 and on the U.S. eight that finished fourth in the 2016 Olympics. Ojserkis has come back to announce the Ham ’N Egger race, which will be broadcast live on the rowing teams’ Facebook page. The boats are mounted with 360-degree cameras, one of five angles from which viewers can watch the race. That alumni would be back to help is not surprising in this sport. The connection that former rowers keep with the program is unrivaled. If you rowed at UW, you’re part of a very tight and active family. It is 3:15, and there are five boats on the water: four boats with rowers picked at random with the freshman boat that was on the water in the morning. Ojserkis, on a motorized boat with Dommer and Callahan, talks about his desire to hike to Mount Everest base camp. Callahan perks up and says he would like to do to it, too. But before logistics can get settled, it’s time for the race. Boat 2, after trailing Boat 3 for much of the race, rallies in the final 500 meters to win the 2,000-meter race. And if you think Ham ’N Eggers don’t matter, you weren’t watching the reaction of the rowers after the finish. While the men were racing, the women were working on starts on Lake Washington, the water calm enough to get out on the big lake rather than the Montlake Cut, Lake Union and the Ship Canal. It’s 4:15, and Farooq is imploring two groups of eight she is following. She is brilliant at motivation. It was a big part of her job as a coxswain in the 1992 and 1996 Olympics. Farooq says everyone is in this together. She sees her role more as a supporter than a dictator. And when she says they are in it together, she is including the men’s program, with whom it shares a facility and some equipment. “We respect the hell out of them, and I think they respect the hell out of us,” she said. At about 4:30, Farooq says it’s time to start heading back to the shellhouse. She wants to be back by 5. Every minute is accounted for in the 20 hours of practice a week allowed by the NCAA. As they get close to home, Farooq tells the boats to “cut the cord,” meaning go as fast as they can. It’s about 5 p.m., and after rowing 40 kilometers and attending classes, the inclination might be to go straight to sleep. But there is no time for that. Not with dinner and studying still to come. But it was rewarded last year with a national title. And even the small moments can make it all worthwhile. But they always do. They always do.